Researchers across western Canada are working towards developing new tools to help producers manage two serious diseases in canola – blackleg and sclerotinia stem rot. This project, led by SaskCanola, partners with the Alberta Canola and the Federal Government under Growing Forward 2 (GF2). This Agri-Science Project, which is still in progress, has multiple activities focused on new discoveries and solutions for managing these diseases. Dilantha Fernando's study into resistance (R-gene) durability of canola cultivars and emergence of virulent blackleg isolates in farmers’ fields used plots to test the difference in performance between resistant (left) and susceptible (right) varieties. Purpose: To identify new major resistance genes for blackleg disease through the phenotypic screening of 500 accessions of Brassica napus, B. rapa and B. oleracea with a differential set of Leptosphaeria maculans isolates. (466 accessions), three lines (AF229-1 N1, AF272-1 N1 and AF 328-4 N2) were identified with potential novel R genes. These lines have been crossed to the susceptible B. napus cv Topas to produce F2 and BC1 populations. A subpopulation of F2 plants is being grown to confirm the presence and map the position of potential novel R genes. For the 538 B. rapa lines screened, 21 lines were selected for another round of testing. Purpose: To use cloned blackleg resistance genes (1) to identify the effective resistance genes, (2) to monitor the changing of pathogen isolates in canola fields, (3) to guide pyramiding effective resistance genes in the development of canola cultivars, (4) to guide the deployment of canola cultivars with various blackleg resistance genes and (5) to identify novel blackleg resistance genes in canola relative species. Progress: Researchers cloned all six published avirulence genes from 20 blackleg fungal isolates frequently used in the project. They also collected RNA sequencing data using samples from transgenes and near isogenic lines that were challenged with different blackleg pathogen isolates. The results of RNA-seq showed that the cloned resistance genes can induce those genes involved in defense and suppress other genes that may produce metabolites for fungal growth. In field trials, researchers identified a horizontal blackleg resistance gene that proved to confer good resistance to all field fungal isolates and performed well under severe blackleg disease pressure. The results suggested that this resistance locus has excellent potential in blackleg management in western Canadian canola production regions. Researchers also identified novel resistance genes from canola relatives including B. carinata, B. nigra and B. juncea. In one trial, the introduction of a novel resistance gene introduced from B. carinata into B. napus proved to be highly resistant to highly virulent blackleg fungal isolates. Researchers will provide all resistance gene-specific molecular markers and their effectiveness information to Canadian canola seed companies so they will be able to pyramid several resistance genes in newly released canola cultivars through marker assisted selection. Purpose: (1) To identify tightly-associated genetic markers for controlling adult plant resistance to blackleg; and (2) to define the underlying genetic architecture of this durable resistance to blackleg in B. napus. Progress: Blackleg disease of canola caused by the fungus Leptosphaeria maculans continues to be a major disease affecting canola yield. Qualitative (monogenic) disease resistance (R) provides full immunity against L. maculans, but becomes ineffective when new races of the pathogen emerge. Quantitative resistance (multigenic) provides durable resistance to various L. maculans isolates and has been shown to be effective in preventing blackleg disease of canola at the adult plant stage (Adult plant resistance (APR)). In this project, researchers screened B. napus germplasm (467 accessions) at the Plant Gene Resources of Canada (PGRC) for APR against two criteria: (i) lack of race specific resistance and (ii) spring type growth morphology. Two hundred B. napus lines were screened twice for APR; 85 lines were confirmed to contain quantitative resistance, resulting in 69 lines being self-pollinated to form the association mapping population. As well, researchers successfully developed and confirmed the methodology for detecting APR response and identifying associated genetic markers. Transcriptomic analysis of the Leptosphaeria maculans (blackleg)-canola interaction to identify resistance genes in canola and avirulence factors in L. maculans. Progress: The infection process of blackleg disease in canola is highly dependent on host recognition and molecular cross talk between the host and the pathogen where pathogenicity-related genes play an important role. However, any given host-pathogen interaction is a very complex phenomenon, which makes it difficult to understand the factors dictating compatibility or incompatibility. In this study, transcriptome profiling of L. maculans was performed in an effort to understand and define the pathogenicity genes that govern both the biotrophic and the necrotrophic phase of the fungus, as well as those that separate a compatible from an incompatible interaction. Researchers analyzed the RNA-seq transcriptome profiling of L. maculans inoculated on susceptible and resistant canola lines at five developmental stages with five biological replications. Sequence characterization and expression profiling of pathogenesis-related genes along with the novel transcripts were performed. From the comparative transcriptome analyses, key genes were highlighted that dictate the interaction between canola and L. maculans, resulting in the identification of key pathogenicity genes that regulate not only the fate of the interaction but also lifestyle transitions of the fungus. Purpose: To analyze blackleg avirulence (Avr) gene diversity and frequency of different Avr genes in different farms. Progress: Changes in the virulence of L. maculans populations had been reported a lot in western Canada, such as changes in AvrLm3, which subsequently leads to breakdown of Rlm3. In this project, 50 representative grower sites were selected from each of Alberta, Saskatchewan and Manitoba from fields that have had blackleg to various degrees. This five-year study provides a unique opportunity to study the long-term effects of crop rotation and other agronomic practices on the rate of pathogen adaptation as well as the relative durability of different resistant sources. In addition, one test plot will be set up in each Prairie province to compare the effect of sowing cultivars in their own residue, rotating cultivars with different sources of resistance, and also gauge the rate of change in L. maculans populations with respect to the avirulence genes analyzed. Knowledge of the Avr genes diversity will be helpful for mastering changes in structure of Avr genes and providing a guide for seed breeders as well as farmers for variety selection. The Avr profile information has already prompted seed companies to incorporate effective R genes into new canola hybrids against the current pathogen population on the Prairies. Some varieties may be made available commercially in 2016, adding new management tools to the fight against blackleg. Purpose: (1) To assess which cultivar resistance genes are most durable to disease pressure and make recommendations on when and how often to rotate cultivars studied; and (2) to examine the potential of emergence of virulent isolates when a new cultivar without corresponding virulent isolates is introduced. Progress: For this study, plots were established with near isogenic lines (NILs) carrying different single dominant genes for resistance for L. maculans (Rlm) and inoculated with 100 per cent avirulent isolates to the corresponding resistant gene. The cultivar Topas (no-R genes) and its isogenic lines with single R-genes, developed by AAFC to compare the durability of different blackleg resistance genes without the influence of host variation, and single Rlm carrying Topas lines will also be seeded in each of these fields for five years (canola on canola) and as a rotation (canola-wheat-canola). 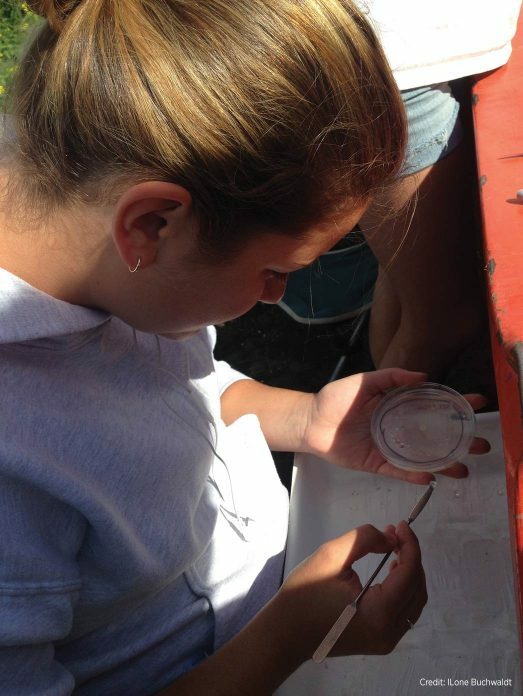 The pathogen isolates spores will be collected and tested to identify changes in the populations to an increasing virulence, followed by differential testing in the greenhouse and PCR analysis in the lab. Each year, the changes will be recorded in the two systems (canola on canola; and canola-wheat-canola) to understand the changes and how a rotation may help in reducing the increase in virulence isolates. Establishing a timeframe for the majority of isolates to gain virulence will help compare the relative durability of different resistance genes and make recommendations on when to rotate each cultivar depending on its resistance gene. Purpose: To develop molecular markers as an efficient tool for genotyping and monitoring L. maculans populations in canola fields across Western Canada. Progress: For effective management of blackleg disease, it is important to know the genotype of blackleg isolates within a field population. To date 16 resistance (R) genes (Rlm1-11, Rlms; LepR1-4) from Brassica have been identified that provide full immunity against L. maculans isolates with matching Avr genes (AvrLm1-11, AvrLms; AvrLepR1-4). Researchers cloned AvrLm2 and AvrLepR2 using map-based cloning in combination with genome sequence comparison. In addition KASP molecular markers for these two genes and all other known L. maculans Avr genes were designed and successfully applied to determining the genotype of close to 200 L. maculans isolates collected from canola fields across western Canada. By knowing the prevalence of these Avr genes in the field populations of L. maculans, breeders will be able to develop appropriate cultivars with resistance genes targeted against prevalent pathogen races (based on Avr genes) on a regional basis. Purpose: (1) To develop a yield loss model to relate the severity of blackleg on canola with the corresponding yield losses; and (2) to evaluate representative populations of L. maculans from western Canada for the occurrence of fungicide resistance. Progress: In field experiments across western Canada, researchers are studying the relationship between blackleg severity and yield. 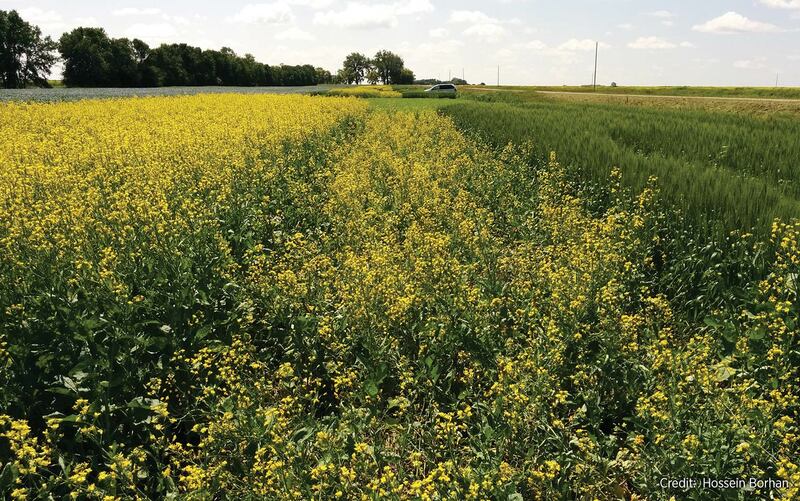 Results show blackleg severity was lower, and seed yield was 120-128 per cent greater, in moderately-resistant to resistant hybrids compared with the susceptible cultivar. In all canola varieties, the analysis showed that pod number and seed yield declined linearly as blackleg severity increased. The yield loss model and associated recommendations being finalized will help producers make informed crop management decisions and estimate economic disease impacts. Researchers are also evaluating the sensitivity of a representative collection of L. maculans isolates from western Canada to the fungicide pyraclostrobin in agar plate and microtiter plate assays. No pyraclostrobin insensitive isolates have been identified so far. In field experiments, results show pyraclostrobin fungicide reduced disease severity in all site years, and increased yield in two site-years. 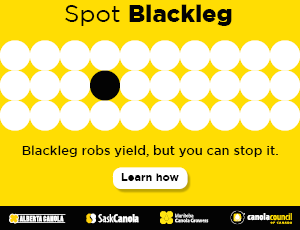 This fungicide could be an effective and sustainable blackleg management tool for canola growers, as long as fungicide stewardship is practiced and included as a component of an integrated pest management plan. Purpose: (1) To identify molecular markers linked to sclerotinia resistance and identification of underlying defense genes; and (2) to transfer of sclerotinia resistance to elite open-pollinated spring-type canola. Progress: Researchers are working to identify genes underlying sclerotinia resistance and to develop molecular markers linked to resistance. Even though sclerotinia resistance is a very rare trait, researchers were able to generate B. napus lines with high level of sclerotinia resistance. A set of 17 S. sclerotiorum isolates representing the genetic and pathogentic variablity of the sclerotinia population in western Canada have been identified. One B. napus line from Pakistan with the highest level of resistance to these isolates was crossed with one of AAFC’s open-pollinated elite canola lines to transfer sclerotinia resistance into a spring-type canola quality background using traditional backcrossing. A population of ~500 doubled haploid backcross lines was phenotyped for sclerotinia resistance in the 2016 growing season and resulted in identification of about 30 lines (six per cent) as resistant as the Pakistani line. Canola breeders can already request seed from AAFC of resistant lines from Pakistan, South Korea and Japan, molecular markers linked to resistance in the Pakistani material and sclerotinia isolates for development of canola cultivars. Open pollinated canola lines with improved sclerotinia resistance will be available for non-exclusive licensing at the end of the current project. Purpose: (1) To identify proteins secreted by S. sclerotiorum that cause or contribute to necrosis; and (2) to develop a method to screen B. napus lines for resistance to their effects. Progress: Researchers want to determine how S. sclerotiorum causes the most noticeable and damaging aspect of disease in B. napus, i.e. the necrotic lesions on the stem that lead to lodging and crop loss. So far they have identified a small number of proteins that are secreted by S. sclerotiorum that have the ability to cause necrosis. The next step is to characterize the proteins and then the most important of these will be used to screen a diverse, global collection of Brassica napus for lines that are more tolerant or resistant to the protein effects. This targeted approach will help to characterize the resistance in lines already identified in the AAFC collection and identify new lines with resistance to the main pathogenicity factors. This trait can then be incorporated into canola breeding programs to develop spring-type varieties with one or a few highly effective and robust stem-rot resistance genes. —Donna Fleury, P.Ag., is an agricultural freelance writer from Millarville, Alta.